* Secretaría de Finanzas de la Ciudad de México. Correo electrónico: ccardoso@finanzas.cdmx.gob.mx. This document examines whether the probability of entering new external markets or the increase in export products on the part of Mexican firms are related to the proximity of diverse multinational firms exporting under diﬀerent trade regimes. The results show that export spillovers are far from homogeneous in their eﬀects on Mexican firms, since their existence is related to the export activity of neighboring foreign firms. Moreover, such spillovers are more likely to appear in places where neighboring national and foreign firms have not only common trade regimes, but also common technological level of production. Se examina si la probabilidad de acceso a nuevos mercados foráneos o el aumento de nuevos productos de exportación de empresas mexicanas se relacionan con la proximidad de distintas multinacionales que exportan bajo distintos esquemas de comercio. Los resultados muestran que los spillovers de exportación distan de ser homogéneos sobre las firmas mexicanas, ya que están relacionados con la actividad exportadora de las empresas extranjeras vecinas. Asimismo, es probable que los spillovers se manifiesten en lugares donde las empresas domésticas y extranjeras compartan no sólo el régimen de comercio para exportar sino también el nivel tecnológico empleado para producir. As a result of the economic process of globalization, various countries, principally developing ones, have boosted their participation in international trade, in part by allowing multinational firms (MNFs) to assemble or transform imported input to make export products. These processing firms (PCS)1 usually benefit from import tax exemptions. The economic justification on the part of governments for permitting the establishment of this type of company has been mainly based on criteria such as job creation, technology transfer, attracting foreign investment and obtaining foreign currency. Over the past decade, the importance of trade in processed goods increased in the economies of quite a few nations. In Southeast Asian countries,2 between 2000 and 2003, PCS generated close to 36 million jobs and, in some cases, sales abroad of processed products represented, on average, 70% of total exports. During the same period, in Mexico and Central America, these firms employed approximately 2 million workers (Singa, 2007). Moreover, between 2005 and 2006, this activity in Southeast Asian countries provided jobs for almost 57 million people. In the region of Mexico and Central America, that figure more than doubled from the previous period, totaling 5 million workers. In some countries such as Malaysia, Macao (China) and Vietnam, exports of processed products came to represent 80% of total exports (Singa, 2007). Despite the huge importance that the presence of companies elaborating processed products acquired in many countries around the world, the literature examining whether the presence of MNFs has an influence on domestic firms’ decisions to export has concentrated mainly on examining MNFs that trade ordinary (non-processed) products.3 Findings from such evaluations are mixed. In some cases, they confirm the influence of MNFs (Aitken, Hanson and Harrison, 1997; Kokko, Zejan and Tansini, 2001; Greenaway, Sousa and Walkelin, 2004; Anwar and Nguyen, 2011) but others do not (Barrios, Görg and Strobl, 2003). 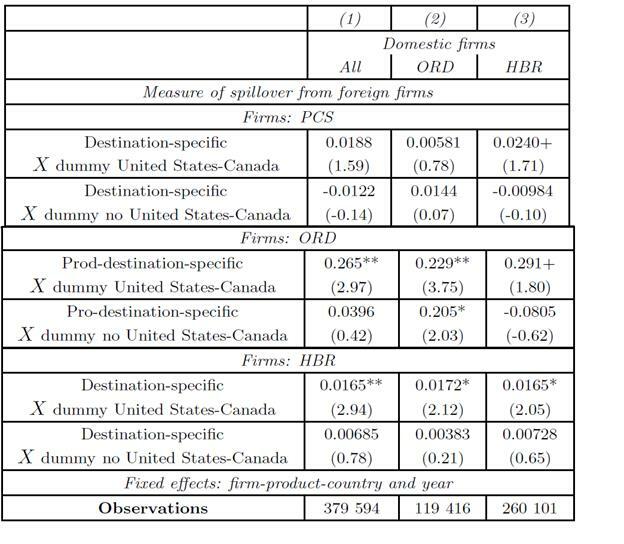 The few studies4 that have directly evaluated whether foreign-exporting PCS propitiate export activities or expansion of destination markets for domestic firms, have yielded inconclusive results, since the findings head oﬀ in two directions: in contra (Mayneris and Poncet, 2015) and in pro (Fu, 2011). Mexico represents an interesting case, by virtue of having established, for more than three decades, foreign firms that export PCS products operating under the program known as maquiladora and, more recently through the program known as PITEX (Programa de importación temporal para producir artículos de exportación), that allows companies established in Mexico (domestic and foreign) producing export products to buy inputs abroad, with the same customs-tariﬀ exemptions and tax benefits contemplated in the maquiladora program.5 In 2006, sales of processed products represented an important percentage of Mexico’s total manufactured exports (Sargent and Matthew, 2008); this shows that exporting PCS products is widely spread throughout the Mexican economy. In addition, in Mexico, there are other foreign firms exporting under a regime of ordinary trade (ORD), that is to say, they do not carry out any activities processing goods. There is also a third type of foreign firm, that we denominate hybrid (HBR), which export both PCS as well as ORD products. In this manuscript, we evaluate whether the probability of domestic firms’ exporting is positively related to the proximity of diﬀerent types of MNFs6 in the same area. Our evaluation is based on the hypothesis of the existence of a phenomenon known in the literature as export spillovers, which supposes that companies, in order to enter into an export activity, have to overcome high fixed entry costs7 (Bernard and Jensen, 2004; Melitz, 2003; Wagner, 2007), which may be diminished by the proximity of established exporting firms. Proximity to other exporters may help lower fixed costs as a result of externalities deriving both from market interactions as well as from other non-market ones. In the first case, the presence of exporters in a particular area may attract other companies facilitating export activities,8 such as input suppliers or trade intermediaries. The second externality is related to the informal exchange of information on export activity or the characteristics products must have to enter into diﬀerent international markets. Without proper data, these externalities are diﬃcult to identify. However, those externalities suggest that a non-exporting company, located where there is a high concentration of exporters, would have better access to information about getting into other markets, and therefore a greater probability of selling abroad. For this reason, in this paper, as in Clerides, Lach and Tybout (1998), Greenaway and Kneller (2008), and Koenig, Mayneris and Poncet (2010), we investigate the total eﬀect9 of spillovers deriving from the agglomeration of other neighboring exporters, which, in our case, are diﬀerent types of foreign-exporting firms. This study contributes to the literature on the topic in several ways. First, we argue that export spillovers from diﬀerent foreign firms manifest themselves heterogeneously on domestic firms, in terms of destination country and/or export product, a topic receiving very little attention in previous research. Fernandes and Tang (2015) show that PCS and ORD companies behave diﬀerently in their exporting activities. PCS firms, being part of a global production/distribution network, have more concentrated sales, both in terms of their products, and in terms of their markets. In turn, ORD firms prove to be more diversified in terms of product and destinations abroad. This diﬀerentiated behavior may be a reflection of the influence exercised by the diﬀerent types of foreign companies vis-à-vis their domestic counterparts. Second, the data used in this study contributes to the analysis of an interesting type of foreign firm, the HBR, which carry out both processed and ordinary (non-processed) trade. The influence of this type of company on the domestic industry has yet to be studied. Finally, this is the first document in the literature that delves into the presence of spillovers, jointly considering trade regimes and the technological intensity of the products elaborated by foreign companies vis-à-vis their domestic counterparts; both elements have been observed to influence the existence of spillovers. Kokko (1994) shows that domestic firms cannot benefit from MNE technology diﬀusion if the technology gap between them is significant. Meanwhile, Mayneris and Poncet (2015) show that the existence of similar trade regimes for both foreign companies and their domestic counterparts encourages spillovers. The theoretical framework guiding our empirical evaluation is based on a simple model inspired in Melitz (2003), in which the fixed costs of exporting to a specific destination are reduced by the existence of nearby firms also selling to the same market. The data used comes from a panel of manufacturing firms created by merging in-formation from a sample of domestic companies in Mexico and from detailed customs data on trade export operations. The panel of manufacturing firms encompasses the period 2003-2010. This information has the advantage of identifying the level of product and destination country, sales made by domestic firms and permits controlling for those individual characteristics related to their entry into the export market. Similarly, merging customs data with a national directory of manufacturing companies permits the construction of agglomeration variables for foreign companies at the municipal level. Estimates show that there is a wide variety in the level of spill-overs in Mexican exporting firms, and that their existence depends on the similarity between foreign firms and their Mexican counterparts with regard to a variety of factors such as export product/destination, export regime and level of technological intensity. Therefore, findings show that export spillover from foreign PCS firms are specific as to their country destination and their influence is limited to Mexican ORD and HBR firms with medium and high technological intensity, respectively. In turn, foreign ORD firms exhibit specific product and country destination spillovers. Their influence is only perceived in domestic ORD firms with low technological performance. Finally, we find that the presence of foreign HBR firms increases participation in foreign markets for domestic HBR firms, specifically those with a high technological level. As to the contribution of spillovers to in the case of domestic firms exporting to markets other than the United States and Canada, only in the case of foreign ORD firms is evidence found of this possibility. The document is structured into various sections. Following the introductory section, Section 2 describes the pertinent literature. Section 3 explains the model posited and derives the algebraic expression for empirical evaluation. Section 4 explains the empirical approximation of the variables for the model and the statistical technique being used. Sections 5 and 6 deal with the origins of the data and findings from the empirical evaluation of the model’s hypotheses, respectively. Finally, section 7 states the conclusions. First of all, there are studies that investigate the presence of export spillover from MNFs on domestic companies. Most of these studies examine whether their existence is due to horizontal or vertical linkages,12 competition among firms and/or the existence of demonstration/imitation eﬀects,13 among others. This is the case of the pioneering study of Aitken, Hanson and Harrison (1997), who, with information from a panel of firms for the period 1986-1990, report that the probability of Mexican firms exporting was positively related to the existence of foreign firms. In line with these findings, Kokko, Zejan and Tansini (2001) find that, in 1998, the export decisions of domestic firms in Uruguay were influenced by the presence of multinational exporting firms. Greenaway, Sousa and Wakelin (2004) show that, during the period 1992-1996, the presence of multinational firms had a positive influence on the export decisions of domestic companies in the United Kingdom and on their propensity to export. In turn, Anwar and Nguyen (2011) found that, during the year 2000, the probability of exporting of firms in Vietnam was boosted by the presence of MNC’s in the same region or by the presence of non-local export-oriented firms. In contrast to this positive evidence, Barrios, Görg and Strobl (2003) argue that there is no evidence supporting the presence of export spillover from MNFs on Spanish firms located in the same sector of economic activity for the period 1990-1994. Another line of literature researches whether the presence of export spillovers originates from the agglomeration of exporters within certain specific geographical areas. With such a focus, Clerides, Lach and Tybout (1998) show positive evidence that this type of spillover exists for Colombia, Mexico and Morocco. In a recent document, Greenaway and Kneller (2008) find that the agglomeration of exporters in the same region and industry was relevant for the entry of United Kingdom firms into exporting activity during the period 1989-2002. In contrast, Bernard and Jensen (2004) find no support for the existence of export spillovers in United States plants getting into exporting between the years 1984 to 1992. Requena and Castillo (2007), using data extracted from Spanish customs houses and a sampling of companies, document that the probability of Spanish firms exporting to an non-local market, in the year 1994, was influenced positively by the concentration of neighboring exporters, who sold the same market14 and belonged to the same industry. Moreover, with a panel of firms based on the merger of data from customs records and business surveys, Koenig (2009) and Koenig, Mayneris and Poncet (2010) find support for the existence of destination specific spillovers in decisions to export by French firms at the end of the nineties. In the case of Denmark, Choquette and Meinen (2014), following the same strategy of using data extracted from customs houses, provide statistical evidence that suggest that the dissemination of information regarding a specific export market can be transmitted between firms through both intra-industry and inter-industry contacts. This document is closely related to both focuses in the literature in a variety of ways. As in the first approach, we consider the existence of export spillover from MNFs on domestic companies, since identifying the factors that can influence the development of the export potential of local industry is a topic of priority in terms of public policy. In this sense, looking at foreign and domestic exporters as a whole in order to derive public policies aimed at encouraging local industry could lead to a bias in the results, since foreign companies have a better ability to absorb knowledge than their domestic counterparts, as Barrios, Görg and Strobl (2003) point out, and as documented by Harasztosi (2016). Following the second focus, we also consider the net eﬀect of spillovers deriving from the agglomeration of exporters. In our case, agglomeration measurements are constructed in order to distinguish diﬀerent types of foreign companies. The preference for the use of this focus is due to the fact that export spillovers can be the joint result of market and non-market interactions. We use proxy variables, in order to distinguish between these two interactions. With regards to the distinction made of MNFs by the type of trade regime (PCS or ORD), this paper takes a similar approach to Mayneris and Poncet (2015) and Fu (2011). Using aggregate data at a provincial level for China, Mayneris and Poncet (2015) found export spillovers emanating mainly from ORD firms and benefiting only those of their domestic counterparts that carry out ordinary trade activities. Meanwhile, Fu (2011), with information on Chinese firms in high-tech sectors in the period 2000-2007, reports the presence of export spillover by PCS firms on local companies. Unlike Mayneris and Poncet (2015) and Fu (2011), in this document, we not only consider the existence of export spillover for PCS or ORD firms, but also for HBR companies. In addition, in contrast to Mayneris and Poncet (2015), the analysis is done specifically considering the eﬀect of non-local firms on domestic establishments using firm-level data. The disaggregated data allows us to avoid possible bias in the estimates, since it allows us to control diﬀerent aspects that influence the export decisions of firms, such as productivity and firm size, as well as other aspects that cannot be observed directly, such as individual strategies and specific fixed destination costs, which are approximated by means of incorporating fixed eﬀects. In contrast to Fu (2011), this evaluation is not done in a particular sector, but considers the entire manufacturing sector and distinguishes the eﬀects of spillovers from diﬀerent foreign firms on a variety of domestic firms. Terms (1 −µ) and µ represent the proportion of the expenditure on home and foreign goods, respectively, of consumers located in j. F j is a good that comprises diﬀerent varieties of foreign goods with a constant elasticity of substitution (CES) among them. In this expression q ij (ω) represents the amount of the variety ω elaborated by firm i and consumed in j . Ω ij represents the group of companies that sell a variety produced in country i to destination j, meanwhile, σ=11-ρ is the elasticity of substitution between varieties diﬀerentiated good which is assumed to be strictly greater than one.18 When the firms sell their products to the rest of countries, they incur transportation costs. We consider these costs as iceberg costs, where if a unit of the good is sent to another country, only a fraction reaches its final destination, and therefore p ij (ω) = p i (ω)∗ τ ij where p i (ω) is the price in country i and τ ij > 0 are the transportation costs. In addition, considering that the available income of consumers in country j for the two types of products is R j and resolving the maximization of the representative consumer utility of (1), we obtain the demand in j for the variety produced in country i.
P j represents the index of prices of tradable goods in region j which depend on the prices of the varieties sold in j. The firms compete in monopolistic competition and obtain profits π i assuming that the only factor is labor, as in the standard model of Dixit-Stiglitz-Krugman. Where w i and l i are the salary and the number of hired workers, respectively. In every country there is a continuum of consumers/workers that oﬀer their unit of work time inelastically. The technology used by the firms is represented by a production function, which comprises a fixed part and a variable part. Without loss of generality, wages are standardized to one. Where the term f ij (A j ) corresponds to the fixed costs of producing and selling in i to j. To incorporate the hypothesis that the presence of exporting firms reduces the costs of access to foreign markets for other companies, such costs are expressed fijAj=f-ijAj-θ where the term f-ij represents the specific fixed costs of a destination j, wich include entry costs as well as the operation, promotion, and distribution and training costs incurred by a firm to export to j. Meanwhile, A j is the agglomeration of nearby establishments that sell the same external market. The θ parameter represents the eﬀect of the agglomeration of firms on the specific fixed costs of destination and can be interpreted as an indication of the existence of export spillovers,19 since if θ equals zero then fixed costs will simply be equivalent to f-ij. Replacing (3) and (7) in (5) we find the net profits obtained by the firm in i that exports to j the variety ω. Given σ > 1, then the first term on the right side of (10) establishes that the decision of whether to export to a specific market j on the part of a firm in i depends positively on its productivity level, and therefore more productive firms are more likely to export. Similarly, the probability of exporting will also increase as preferences of consumers in the destination country for imported goods increase, and decrease transportation costs and the fixed costs that are specific to each destination market increase. Since export spillovers reduce fixed costs, they also increase the possibility of a firm exporting. Finally, the equation includes a random ε ij term denoting those unobservable aspects of the firms in their export decisions. The theoretical model posited requires, for its empirical evaluation, detailed information on the products exported by firms to diﬀerent destinations. To do so, we use the information on products exported by companies, according to the 8-digits of the Harmonized System (HS).20 This level of detail in specifying products allows us to establish clear diﬀerences among the goods exported by a single firm21 and to examine the influence of export spillover on export decisions at the level of firm-product-destination country. As for the term σ, which represents the substitution elasticity of goods imported by consumers abroad, we believe that, with the inclusion of fixed firm-product-country destination eﬀects in the estimates, the existing diﬀerences between the elasticities of products belonging to diﬀerent sectors are controlled for. One major aspect that is also taken into account in the evaluation is the size of the firms,26 which, according to empirical evidence (Bernard and Jensen, 2004), is a factor influencing firms’ decisions to export. Moreover, variables of job productivity, company size and market-access indicator are expressed in logarithms in the estimates. The agglomeration variable (A j ) with which we analyze the presence of export spillovers uses the number of foreign-exporting firms in the same municipality selling the same destination as the domestic firm (a destination-specific measure). This variable is similar to that used in other studies on export spillovers,27 such as Koenig, Mayneris and Poncet (2010) and Harasztosi (2016). In addition, in this document, we use other agglomeration variables to measure the presence of spillovers. These measures are product specific28 (number of foreign exporting firms in the same municipality, selling the same product abroad) and product-destination specific (number of foreign exporting firms in the same municipality, selling the same product to the same destination). The expression (E ij ) is defined as a dichotomous variable indicating whether the firm began to export product i to destination j in time t, where E ij takes the value of one when recording a flow of exports done by the triad firm-product-destination country in time t and not done in t−1. Moreover, it takes the value zero when the triad firm-product-destination country did not sell abroad in t and nor so the previous year. In this specification, permanent export flows are not considered. The advantage of this definition, in contrast to using a binary variable with the export status, lies in the fact that persistent flows of exports do not influence the estimates, allowing one to focus the evaluation on cases where firms begin to export a specific product to a particular market, which is when they incur fixed entry costs for the destination country and where export spillover should be of importance. In the estimate from Equation (10), there are other aspects that require attention, such as the endogenous issue. Bernard and Jensen (1999) prove the existence of double causality between export capacity and productivity. This problem occurs because the agglomeration of neighboring firms positively influences a company’s decision to export. Its exports increase the agglomeration, which, once again, will have an eﬀect on its export capacity. To solve the matter of double causality, we follow Bernard and Jensen (2004) and the variables lag one period in time. Another issue is the problem of clustering described by Moulton (1986, 1990), arising when microdata is used in regressions with regard to aggregate variables, which leads to the standard error being underestimated. To deal with this problem, which occurs in all the estimates, standard errors are corrected by clustering at the municipal level, where exporting firms are located physically. In this section, we describe the information sources used to calculate the variables described in the empirical approximation, as well as the way in which the databases were constructed. Subsequently, the BDE was merged with a random sample of manufacturing firms that are included in the Annual Industrial Survey (Encuesta industrial anual, EIA), which is elaborated and processed by the National Institute of Statistics and Geography (Instituto Nacional de Estadística and Geografía, INEGI) of Mexico. The EIA contains information on employees, production, sales and remuneration of manufacturing establishments (excluding maquiladoras) with more than 15 employees, in the 21 manufacturing industries. The period used for the EIA encompasses 2003 to 2009 and, from this source, we obtained the information on labor productivity (sales34/number of employees), size of the company (number of employees)35 and location of the manufacturing plant. One limitation of the EIA is that it only allows the identification of firms that exported mainly in trade regimes of ORD and HBR. This is because, during the period of analysis, information on PCS companies was obtained via a diﬀerent survey, and was therefore not considered in this study. For the purposes of analysis, the resulting BDE-EIA database was restricted as follows: i) it only considered firms found in both information sources; ii) it did not take into account companies with more than one establishment or multiple plants, since it was not feasible to identify what products and trade flows corresponded to which of their diﬀerent locations; iii) to avoid excess null trade flows, it only considered those countries representing up to 95% of the firms’ export operations; iv) the information corresponding to 2003 was eliminated from the database since it was taken as referent for the construction of the dependent variable; and v) due to the fact the evaluation focuses on domestic companies, those establishments that were identified as foreign were eliminated. Finally, we incorporated information about to the distance between Mexico and diﬀerent destination countries for the exports of domestic firms, as well as the data on total imports made by those destination countries. For the former, the values were calculated by the great-circle formula using location information (longitude and latitude) on the capitals of the countries,36 which came from the CEPII (Centre d’Études Prospectives et d’Informations Internationales) Geo Dist database.37 Meanwhile, import figures (6-digit HS) came from the U.N. COMTRADE database. The final database is comprised of 2 663 companies with domestic capital, exporting at least one product to one of 79 possible destinations during the period 2004-2010. It represents an unbalanced panel because of the imperfect matches with the variables considered. In Table 1, we show the descriptive statistics of the final database. The data shows diﬀerences in the levels of productivity and size of companies among the varying geographical areas considered. Average productivity and firm size are greater when their destination markets are further away. This can be seen clearly if we compare the American continent with Asia. In the first case, we get an average in the logarithms of productivity and size of 6.44 and 5.26, respectively, with an average in the distance logarithm of 6.21. In turn, for Asia, there is an average of 6.64 in the productivity logarithm and 5.49 company-size logarithm, while the average for the distance is 9.21. This suggests that, in order to access markets further away, firms have to make an additional eﬀort in productivity that allows them to take on the shipping costs needed to reach remote marketplaces. Moreover, figures for the indicator of market access reflect that the greater the demand exercised by consumers for imported goods and the shorter the distance to these buyers, the more feasible trade to those destinations becomes. Source: Own elaboration with information from the BDE-EIA described in section 5.1. The market-access variable is calculated as Ln imports/Ln distance . Foreign companies in the BDE were assigned the municipality where their production plants are located, using the Sistema de información empresarial mexicano (SIEM).38 In computing the measurements of specific destination spillovers, we added the number of companies exporting to the same country located within the same municipality. This procedure was done for each type of foreign company (PCS, ORD or HBR). Table 2 shows descriptive statistics on the number of neighboring foreign-exporting firms that domestic firms have, as well as the specific measure of destination. Domestic-exporting firms showed, on average, 1.9 neighboring foreign PCS firms exporting to the same country one year earlier. The percentage of domestic companies with zero neighbors was 89.5% and 2.2%, had more than 10, with a maximum of 302 neighboring establishments. In turn, the average for neighboring ORD foreign firms was 1.2, with a maximum of 19 establishments. The percentage of domestic companies exporting, with no neighbor, was 64.8% and 0.6% had than 10. In the case of non-local HBR companies, domestic firms had 12.1 neighbors on average, with a maximum of 293 establishments within the same municipality. The percentage of domestic companies with no neighboring foreign company was 24.2% and 28.1% had more than 10. Source: Own elaboration with information from BDE. Information reported corresponds to foreign firms exporting to the same country as domestic firms one year earlier. These comparisons point indicate that it is more probable that domestic exporting companies are influenced by foreign HBR companies, since the great majority of positive export flows occur in municipalities with a high concentration of HBR firms. On the other hand, the agglomeration of PCS firms shows greater dispersion with regard to the average calculated, suggesting the existence of a broad heterogeneity in the location of this type of establishment among the municipalities where domestic firms are located. Therefore, it seems that their influence is negligible or limited to places where the economic activity of these firms is more concentrated. In this section, we show the results of the empirical estimates of Equation (10) relative to company export decisions. First we examine the influence of spillovers of foreign-exporting firms on the probability that domestic firms can sell to a market j. We do this by considering the measure of destination-specific spillover, as well as other spillover product-specific and product-destination specific measures. Below, we evaluate once again these influences, considering three types of foreign companies according to the product they trade abroad (PCS, ORD and HBR). We also analyze the importance of the spillovers generated by the three types of foreign companies for local companies with respect to the possibility of exporting to diﬀerent geographical areas. Finally, we segment the sample of domestic companies according to the type of goods exported (PCS or HBR) and examine how the three types of foreign companies influence their decisions to export to a particular destination j. 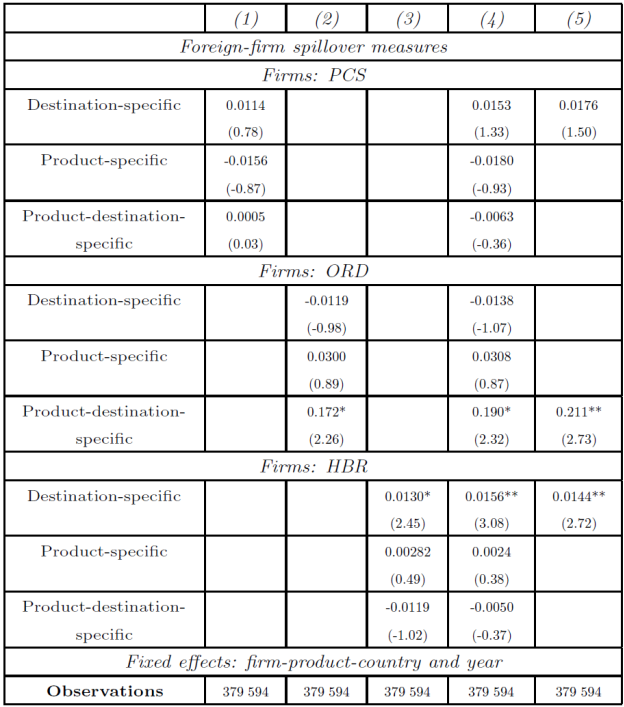 The first column of Table 3 reports the results of the estimates of the equation, describing the export decision of firms as a function of certain observable characteristics. The parameters obtained are significant at 1% and the signs are in keeping with that derived from the algebraic expression of (10), that is, the productivity of domestic firms has a positive influence on their decisions to begin exporting to a particular destination. Moreover, company size is also relevant for the internationalization of their sales. Statistics in parentheses. The statistics are constructed using standard errors clustered at the level of municipality. All the independent variables lag one period. The variable market access was calculated as Ln imports ijt /Ln distance jt . The marks **, * and + indicate a significance level of 1%, 5% and 10%, respectively. Results with respect to productivity-size and exporting activity indicate that larger firms are more likely to complement each other and to be vertically integrated so as to generate economies of scale, compared to small firms. This advantage allows them to be more productive and better face the costs of selling their products abroad. Moreover, the less costly it is to reach a large number of external consumers, that is, easier access to external markets, the greater the possibility of exporting, in keeping with Melitz’s model (2003). When the measure of destination-specific spillover is considered in the regression (column 2), the findings indicate that exports by domestic firms to country j are influenced positively by the agglomeration of other neighboring foreign firms that sold to the same country j one year earlier, in line with the findings reported by Koenig (2009) and Koenig, Mayneris and Poncet (2010). So as to evaluate the existence of other types of spillovers, in the following estimates, we gradually incorporate other measures related to the specificity of the product and of the product-destination.39 In column 3, we include a specific product variable. The results indicate that the coeﬃcient of this measure is not statistically significant, since the magnitude of the variable of the destination-specific spillover remained unaltered and significant at 5%. In the fourth regression, when the product-destination-specific measure is considered, no statistical evidence is obtained supporting the presence of this type of spillover. In the last column, we report estimated coeﬃcients, considering all the variables from previous regressions. The parameter referring to the measure of destination-specific spillover shows a slight increase and remains significant. These findings point the fact that the eﬀect, in general, of the spillover of non-local companies on domestic ones is more closely associated with the specific destination of the sales abroad than with the elaboration of a particular product. In Table 4, we report estimated coeﬃcients, considering the three spillover measures used in the last regression in Table 3 for the three types of foreign PCS, ORD and HBR firms. In column 1 of Table 4, we see that the estimated coeﬃcients for the three measures related to the concentration of foreign-exporting PCS firms do not provide evidence in favor of the existence of spillovers. One possible explanation is that the influence of these firms on domestic exporting activity may be restricted to certain productive sectors or to very specific destination markets. Statistics in parentheses. The statistics are constructed using standard errors clustered at the level of municipality. All the independent variables lag one period. Estimates also included as covariables: Ln f irm size it , Ln job productivity it and Ln market access jt . The variable market access was calculated as Ln imports ijt /Ln distance jt . The marks **, * and + indicate a significance level of 1%, 5% and 10%, respectively. In turn, results from column 2 reflect the existence of specific product-destination spillover from non-local ORD firms on domestic ones. In contrast to PCS firms, the eﬀect may be associated with sharing specific information on the product, such as the design, labeling, packing, demand or quality that are required by foreign marketplaces. This result is similar to those reported in other studies reporting on the existence of specific product-destination spillovers on countries with a slight or nil presence of PCS firms, as in the case of Koenig, Mayneris and Poncet, (2010) and Harasztosi (2016). When the case of non-local HBR firms is analyzed, we find a positive and significant relationship between the level of concentration of foreign firms that sold one year earlier at with that of domestic companies exporting to the same destination. Compared to the other two types of foreign companies, this situation seems to reflect the influence on domestic companies of being able to share specific information on access to destination countries, such customs requisites and restrictions, commercial regulations, ways of doing business, market structure, language, etc. To find out whether the results obtained are valid for diﬀerent subsamples, a series of tests were run considering factors that might have a bearing on the existence of the export spillovers reported. In the first column of Table 5, by way of comparison, we see the coeﬃcients of the last estimate of Table 4, representing the specification to be validated. Statistics in parentheses. The statistics are constructed using standard errors clustered at the level of municipality. All the independent variables lag one period. Estimates also included as covariables: Ln firm size it , Ln job productivity it and Ln market access jt . The variable market access was calculated as Ln imports ijt /Ln distance jt . The marks **, * and + indicate a significance level of 1%, 5% and 10%, respectively. 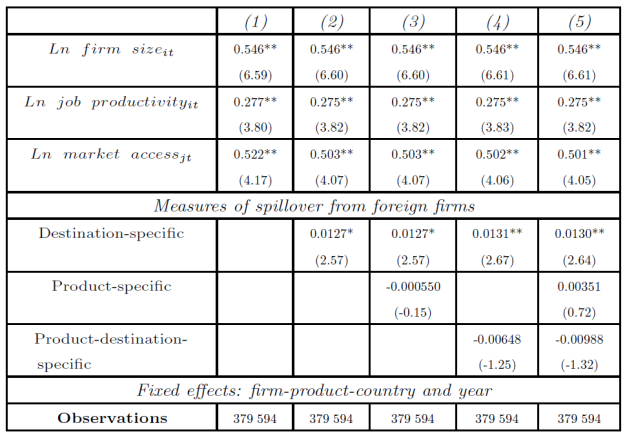 In the second column are the estimated parameters of spillover variables without considering the firms’ main export products.40 We did this to test the hypothesis that, since the majority of firms, when beginning to export, do so to a single country and later add other countries to their portfolio (Lawless, 2009), the eﬀect of spillovers may be concentrated or only show up in the most relevant products. The results obtained show no substantial changes with regard to the column 1 of Table 5 and suggest that spillovers are relevant for the subsequent products that companies sell abroad, as well as the first ones. One aspect that might cast doubt on the results is the geographical concentration of exporting activity, since locations near large centers of imported-goods consumers supports a greater density of foreign and domestic exporting companies, thereby generating a favorable environment for a prolific exchange of information on the nearby marketplace. If this were the case, then we would expect to find serious diﬀerences with the rest of the country and we might conclude that the existence of spillovers is due, in great part, to a border eﬀect. In the case of Mexico, this situation is all the more relevant, since it neighbors on the United States, the world’s biggest market. To exclude this probable border eﬀect from the estimates, the regression in column 3 shows the coeﬃcients obtained without considering all the Mexican municipalities sharing a border with the United States. The parameters calculated once again show no major modifications. Similarly, to ensure that export spillovers cannot to be explained by greater economic activity in a certain region, such as that of the central part of Mexico, column 4 of Table 5 shows the estimate excluding municipalities belonging to the Federal District and the State of Mexico which, jointly, represent Mexico’s capital region. In this last case, the parameters calculated increase in magnitude of the variables considered. However, their significance persists. The next regression excludes both the municipalities of the capital region as well as those along the United States border. Again, we see an increase in size without a change in the tendency of the results. Moreover, the spillover measure associated with PCS firms is once again only significant at 10%, reinforcing the idea that its eﬀect does not generally occur for all domestic companies, but, rather, its sphere of influence is limited. To prove that the findings of the regression in column 1 do not solely come from firms exporting a large number of products to diﬀerent destinations, we exclude the municipalities concentrating the greatest number of cells with positive export flows at the level of firm-product-country and firm-products from the estimates shown in columns 6 and 7, respectively. These restrictions in the number of observations do not change the conclusions that can be drawn from the first regression. In the final regression, the exporting status of firms is used as dependent variable, permitting persistent export flows to influence estimates. Although the change in variables considerably increases the number of observations, findings are the same as in the initial regression. 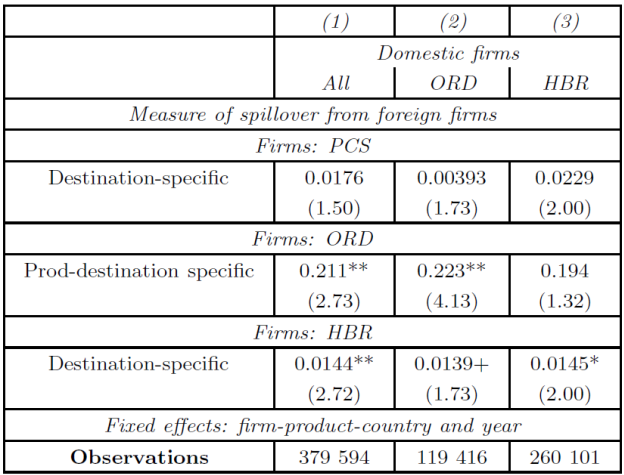 To delve further into the influence of export spillovers on foreign firms, the sample was divided into domestic firms exporting ORD or HBR products and, for each subsample, the specification of the comparison regression was applied (column 1, Table 6). Column 2 of Table 6 reports the coeﬃcients of spillover variables in the regression of a subsample of domestic companies trading ORD products abroad. Findings show that the agglomeration of foreign firms nearby selling PCS products, in general, does not increase the possibility of exporting to a specific market for this type of local company. In contrast, we find that foreign ORD companies have a positive export spillovers eﬀect on domestic firms also catalogued as ORD. The preceding suggests that the externalities between domestic and foreign firms are more likely to show up in agglomerations where both types of companies share the same trade regime, as Mayneris and Poncet (2015) found in the case of China. When considering foreign HBR firms, we find that they have a positive and significant eﬀect, increasing by 10% the probability of domestic ORD firms going to a new destination. This influence may be related to the fact that HBR firms not only have strong links abroad, but also have commercial contacts with diﬀerent local productive sectors. When the subsample of domestic companies involving HBR products is used, the panorama is diﬀerent. In this case, non-local PCS or ORD companies are not found to increase the probability that these companies export. Only foreign firms also making HBR products were found to have a positive eﬀect on these firms. This would seem to indicate once again that externalities emanating from the presence of foreign companies are reinforced when occurring in a trade regime similar to that of domestic ones. A relevant question for economies that depend greatly on a small number of countries, as is the case of Mexico, is whether export spillovers increase the possibility that domestic firms export to other diﬀerent international markets. To evaluate such an eﬀect, spillover measures are multiplied by two dummy variables indicating the export destination. The first, identifying the United States-Canadian market, and the second, the rest of the countries. Just as in the preceding section, the evaluation consists of distinguishing between types of domestic companies. In the first column of Table 7, we can see that, in general terms, spillovers generated by non-local ORD and HBR exporting companies on Mexican companies are solely associated with sales to the United States and Canada. PCS firms show no type of eﬀect. Statistics in parentheses. The statistics are constructed using standard errors clustered at the level of municipality. All the independent variables lag behind one period. Estimates also included as covariables: Ln firm size it , Ln job productivity it and Ln market access jt . The variable market access was calculated as Ln imports ijt /Ln distance jt . The marks **, * and + indicate a significance level of 1%, 5% and 10%, respectively. When only domestic ORD companies are taken into consideration, the situation is quite similar to the one shown in the preceding regression. However, there is also significant evidence that the proximity of non-local ORD firms exporting the same product to the same destination as domestic ones encourages these firms to access markets other than the United States market. Upon examining domestic HBR companies, we find a marked presence of export spillovers associated with the sale of products to the United States-Canadian area. In addition, the results emanating from variables corresponding to foreign PCS and HBR firms seem to indicate that the principal sales market abroad for domestic firms elaborating processed products are the neighboring countries to the North. When explaining the existence and magnitude of the eﬀect of export spillovers, one ma jor aspect that has not received much attention is that the eﬀect of such spillovers may be related to the type of activity of domestic companies. Kokko (1994) provides evidence that the eﬀect of foreign firms on their local counterparts is not the same in all sectors, since these companies may operate preponderantly in industries where their products and technologies have more in common with local companies. To take this possibility into account, subsamples of domestic companies were divided into three headings according to the technological intensity of the products elaborated, using the classification proposed by the Organisation for Economic Cooperation and Development (OECD) as a basis.41 Analyzing the findings reported in column 1 of Table 8, we see that a higher concentration of foreign PCS and HBR firms increases the propensity of domestic companies producing goods in high-tech sectors to export. This eﬀect is most common in domestic HBR firms (column 7). One possible hypothesis to explain this result is that companies in high-tech sectors need continual information on the changing needs of the marketplace abroad, since the life cycle of the products they elaborate are short-lived due to the speed with which technology and customer tastes evolve. These factors force companies to make continual adjustments to spending on the commercialization, distribution and marketing of their products abroad, among others. Domestic companies may be obtaining the constant flow of information that such adjustments require from foreign PCS or HBR firms, since they also depend on this information, and can obtain it from the global production chain of which they form a part, a chain that elaborates processed products by having updated knowledge on worldwide consumer and logistic trends for high-tech products. Transmition of this information to domestic HBR firms is quite probable, favored by the environments of high agglomeration that distinguish high-tech sectors in Mexico, with noteworthy participation by companies trading processed goods (Carrillo and Gomis, 2007). From the estimates presented in column 2 of Table 8, we can see, in general terms, that foreign exporting firms do not seem to influence domestic companies operating in sectors with average technological intensity. However, if we distinguish between ORD and HBR domestic firms, we see a positive and significant eﬀect for domestic ORD establishments coming from foreign PCS ones (column 5). This would seem to indicate that in certain sectors this type of domestic ORD exporting company also benefits from the proximity of their foreign counterparts elaborating PCS products. On the other hand, in column 3 of Table 8, we can see the presence of export spillovers in low-tech domestic firms. This presence also shows up in domestic ORD firms (column 6). One way of interpreting these findings is that firms in low-intensity technological sectors face entry barriers to getting into non-local markets, since low-skilled labor can limit their capacity to boost productivity and take on the costs associated with export activity. Therefore, domestic firms seem to highly value information on non-local market acquired from foreign ORD companies through the client-provider links they establish. The aforementioned findings suggest that domestic companies operating under a HBR trade regime in sectors with high technological intensity are more likely to benefit from externalities emanating from foreign firms elaborating processed products. On the contrary, the assimilation of said externalities on the part of domestic ORD firms seems to be present solely in sectors with low technological intensity. Therefore, the existence of spillovers is not totally conditioned by the aﬃnity foreign and domestic firms have in the exporting regime within an industrial concentration, but also by the technological similarity between the companies within the agglomerations. By using a rich database that combines information from the trade and production of domestic companies, as well as detailed measure that capture the agglomeration of foreign firms at a very fine level, this research examines whether the presence of foreign-exporting firms using diﬀerent trade regimes increases the probability that domestic firms will begin to export or to diversify their presence on foreign markets. Just as in other research (Aitken, Hanson and Harrison, 1997; Kokko, Zejan and Tansini, 2001; Greenaway, Sousa and Wakelin, 2004), the estimates generated provide statistical support to the hypothesis that the export decisions of domestic firms in Mexico, in general, are indeed influenced by the presence of foreign-exporting firms. However, a diﬀerent picture emerges when considering foreign companies separately according to the trade regime they follow. The results show that the eﬀects of spillovers are not present, nor do they occur homogenously on domestic firms. The findings point to the fact that the presence of spillovers is not only favored by an environment where domestic and non-local companies have the same trade regime in common, but also one in which the goods produced and the technology used are similar, despite not sharing the same trade regime. This could explain the lack of conclusive evidence on the existence of spillovers from PCS firms on domestic firms in Mayneris and Poncet (2015) y Fu (2011), and could indicate that both of the findings of my paper can be considered special cases of a more general analysis, in which both the technological intensity, as well as the trade regimen of domestic and foreign firms as determining factors in the existence of export spillovers are important factors. Moreover, the findings of this paper might be used to elaborate more eﬀective public policies for incorporating domestic firms into export activities. For example, if one seeks a policy spurring domestic firms to enter markets other than the North American area, it would be most recommendable, in light of the findings in this paper, to stimulate the presence of foreign ORD firms vis-à-vis their domestic counterparts. However, according to estimates, it is quite probable that their influence is limited to sectors of low technological intensity. In turn, if a country desires to spur entry into export activity or the sale of new products abroad by domestic companies from sectors with medium and high technological intensity, what is most recommendable would be to propitiate the presence of PCS or HBR firms. However, the new additions would likely center on the United States or Canadian markets. There are still issues for future research on the incidence of export spillovers on foreign PCS or HBR firms with regard to the possibility of entering into export activities or diversifying markets by domestic manufacturers. It is necessary to research the mechanisms by which the eﬀects of spillovers are generated from diﬀerent foreign companies to diﬀerent domestic ones. I am thankful for the valuable comments and recommendations of Rosella Nicollini, as well as the suggestions of Josep Lluís Roig and Gerardo Esquivel to the first drafts of this document. Also to be thanked are the observations made by the two anonymous reviewers and the kind eﬀorts of Ana Miriam Ramirez. Moreover, I have a great debt of gratitude with staﬀ from the Secretaría de Economía for the use of anonymised data and Gerardo Durand and Gabriel Romero for granting me access to Instituto Nacional de Estadística y Geografía (INEGI) data at the oﬃces of INEGI in Aguascalientes, Mexico, subject to the commitment of complying with the confidentiality requirements set by Mexican law. This research was funded in part by a PhD Fellowship from Conacyt (Consejo Nacional de Ciencia y Tecnología, México) and the by financial support received from project ECO2010-20718 of the Spain Ministry of Education and Science. The points of view and conclusions put forth here are the exclusive responsibility of the author. 1In this document, we use the term PCS interchangeably to refer to both the processing firms and the goods produced by these companies. 2Singapore, Korea, China, Indonesia, Malaysia, Philippines, Thailand, Cambodia, Japan, Mongolia and Vietnam. 3The reason lies principally in the fact that, in the countries considered in the studies, there are no firms that trade processed goods or the export of these PCS are not relevant. 4Frequently, the limiting factor is the non-existence of -or lack of access to- detailed information identifying the regime by which firms export. In the case of Mexico, information from customs oﬀers the possibility of identifying those firms trading processed and ordinary (non-processed) products abroad. It likewise allows identification of those companies selling both types of products abroad. 5The maquiladora program began operations in 1965 and the PITEX program in 1985. At the end of 2006, the Mexican government published a decree merging both programs into a single promotional plan called Program of the Maquiladora Export Manufacturing Industry (IMMEX). 6In our evaluation, we define MNFs as those companies financed mainly by foreign direct investment. This description also applies when we refer to foreign or non-local companies in this document. 7These costs may include commercialization and distribution channels, compliance with regulations, market research, information on consumer preferences and the preferences of external markets (Kneller and Pisu, 2007). 8Public intervention for the creation or improvement of infrastructure also generates positive externalities by bringing down costs. 9These encompass the net result of market transactions and non-market interactions, as well as the eﬀect of competition among firms. 10For a review of empirical studies encompassing the existence of this type of spillover, one can consult Blomström and Kokko (1998), Görg and Strobl (2001), Greenaway and Kneller (2008), as well as Görg and Greenaway (2004). This last article also evaluates the presence of spillover on domestic-company wages. For the case of Mexico, Reyes, Romo and Bazdresch (2004) review the most relevant empirical studies involving the topic of spillovers arising from the presence of foreign capital. 11By way of synthesis, the diﬀerences lie basically in what type of company do the spillovers come from (foreign exporters or exporters in general) and the non-exporting firms that reap benefit from these externalities, be they domestic or all types of establishments. 12The term horizontal linkage refers to interaction between companies in the same industry (intra-industry), whereas vertical linkage corresponds to forward and backward linkage (client-provider relationships) between firms from diﬀerent industries (inter-industry). 13For an understanding of how channels of competition and of demonstration/imitation operate, see Görg and Greenaway (2004), and Kneller and Pisu (2007). 14The use of detailed information from the trade operations of firms provides the authors the opportunity to distinguish not only whether the firm exported, but also to what market exported. With such data, it was possible to evaluate dimensions previously unexplored in the literature. 15Bernard and Jensen (2004) show that such entry costs are not insignificant and that individual characteristics, such as company size, strongly aﬀect the probability of exporting. Likewise, Roberts and Tybout (1997) find that sunk costs to enter external markets are important. 16In the Melitz (2003) model, productivity and fixed entry costs play a relevant role in company decisions to export, since only firms with a suﬃcient level of productivity are able to overcome high entry costs and access foreign markets. Therefore, only the most productive companies choose to export. For a review of the empirical studies that have examined the hypothesis of self-selection, see Wagner (2007). 17This criterion of modeling was chosen because the existence of spillovers may be more closely associated with exporting to certain countries, as is shown by Koenig (2009). Moreover, under a diﬀerent focus, Krautheim (2009) finds that the exchange of information between firms selling to the same market reduces the individual fixed costs associated with exporting and increases the probability of selling abroad. 18Several studies provide evidence for this assumption. For United States and Canada, see Head and Ries (2001) and for a group of countries, see Erkel-Rousse and Mirza (2002). 19From this expression we can see that ∂fijAj∂Aj<0, so that a high degree of agglomeration of exporters would lead to a decrease in fixed costs for a specific destination j. 21In the case of Mexico, this is the most detailed level of breakdown possible. 22The choice of this (6-digit) disaggregation in import flow is due to the fact that it is the most detailed level, where the nomenclature of products is homogeneous internationally. In addition, using this variable, in contrast to the GDP of destination countries, allows us to better capture the demand of local consumers for the diﬀerent products imported. 23With the inclusion of these eﬀects can also control other aspects that are assumed not to vary widely over time, such as export strategies or preferences to sell certain products to certain destinations abroad. 24In this study, calculating the physical distance between Mexico and the country where the goods are sold was done applying the great-circle formula, which measures the shortest line between two points on the globe. This takes into consideration the location (longitude and latitude) of the points. In contrast to the Euclidean distance, which calculates the distance between two points on a straight line, this measurement replaces straight lines with curved ones. This makes it possible to obtain more closely approximate distances between two locations, considering Earth’s geography. 25The creation of a new variable does not modify the essence of the expression (10), since it can be expressed within this equation by simple algebraic substitution. 26In terms of the theoretical model developed in this document, this factor is present implicitly. If we consider the number of workers required by the firm (Equation 6), jointly (3) and (7), one finds the following expression: lω=φωPjσ-1ρτijσμRj+fijAj where it is possible to see that ∂l(ω)∂φ(ω)>0, that is, the most productive firms also turn out to be the biggest employers of labor. 27On the topic of export spillovers, there is no consensus on the best measure to use, and it depends to a good degree on the information available. In the literature, a number of diﬀerent variables have been used, including: the logarithm of the percentage of exporting companies (Koenig, 2009), the number of exporters (Aitken, Hanson and Harrison, 1997; Requena and Castillo, 2007), the logarithm of (1 + number of exporters), as in Andersson and Weiss (2012), and Dumont, et al. (2010); the relative importance of the exports of a group of businesses (Greenaway, Sousa and Wakelin, 2004) or dummy variables to indicate the presence of exports (Mayneris and Poncet, 2015), among others. 28This specific product variable may be interpreted as a way to detect the presence of spillovers horizontally, since it takes into consideration firms in the same industry (intra-industry), within a certain area. Similarly, the specific product-destination variable can be seen as a horizontal measure particular to a destination. 29When the temporal dimension of the panel is short, the imprecision in estimating a large number of fixed eﬀects contaminates the other parameters in the estimation, due to the non-linearity of the model. 30The technique proposed by Chamberlain (1980) uses conditional estimates of maximum-likelihood to correct the problem of inconsistency in the parameters. 31For reasons of confidentiality, firm-product-destination country trade flows were identified by means of a binary variable where 1 indicated exports and 0 the absence thereof. Also, to preserve the anonymity of establishments, information regarding tax-identification numbers or codes was not used, so that the information used can be considered a catalogue of exporters by product and destination. 32The term E ijt was constructed by means of the binary variable identifying firm-product-country destination country flows for the years 2003-2010. 33A binary variable was constructed to identify each category. The criterion for considering a firm to be foreign is that at least 51% of its capital is foreign. 34Sales figures are expressed in real terms, using the Producer Price Index (PPI) and based on the Banco de México and INEGI (Base year: 2003 =100). 36To calculate the distances between Mexico and the United States, we considered the distance between the municipality where the firm is located and the center of the United States. 38SIEM is a public database containing information on the characteristics and locations of productive establishments and activities regarding trade, industry and services in Mexico. This system was created by the Mexican government as a tool for promoting business, linking companies and elaborating statistics. Information updates are mandated by law: http://www.siem.gob.mx. 39The specific product measurement was done by adding together all products with the same 4 digits of the HS that were located in the same municipality. 40To include a greater number of products, these were defined as a 4-digit HS. 41Included in the high-tech sector are industries related to chemicals, machinery and equipment, computer-equipment manufacturing, electric -and electronic- equipment manufacturing, and transportation equipment. Industries related to oil and coal, plastics and rubber, non-metallic ore products and metallic products are considered of average technological intensity. The sector of low technological intensity encompasses the rest of the industries.